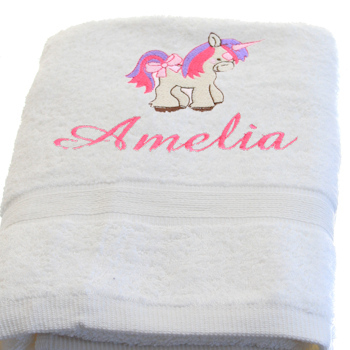 A magical unicorn horse embroidered bath towel is a lovely gift. Bath size towel made from soft cotton. Your choice of towel colour. Enter the name you would like personalised with embroidery and choose your thread colour for the name. The unicorn motif will be customised to coordinate with the thread colour selected.